It would not be an exaggeration to say that I'm a hue-ge Kaffe fan. 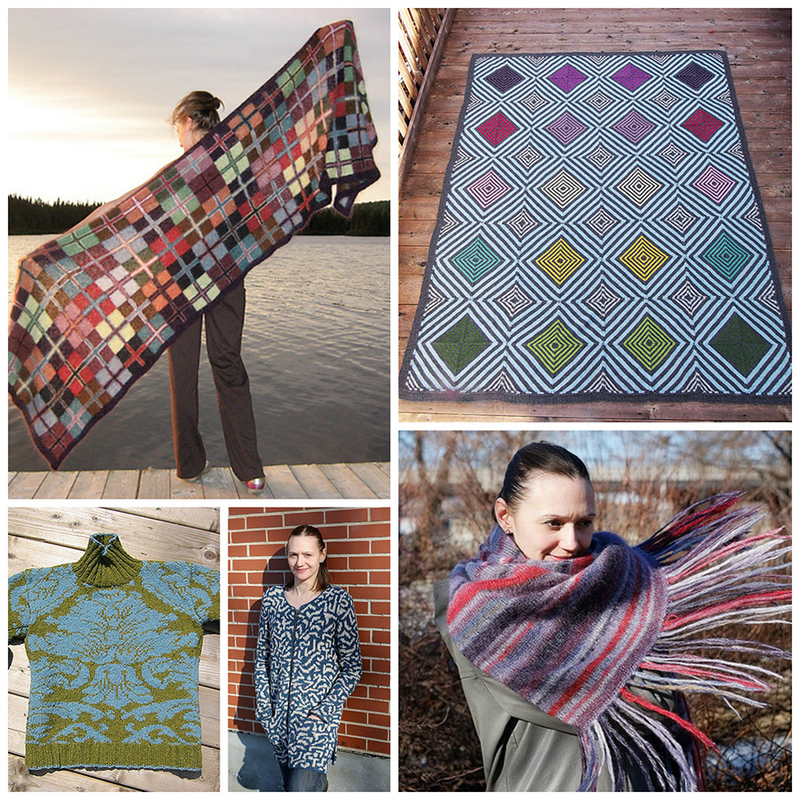 From top left clockwise: Sofia Wrap, Kaffe Rowan Mystery Afghan KAL, Earth Stripe Wrap, Staccato Coat, Brocade. Now -- let's put it out there. While many patterns in newer Rowan mags are "by Kaffe", in reality they were designed decades ago. 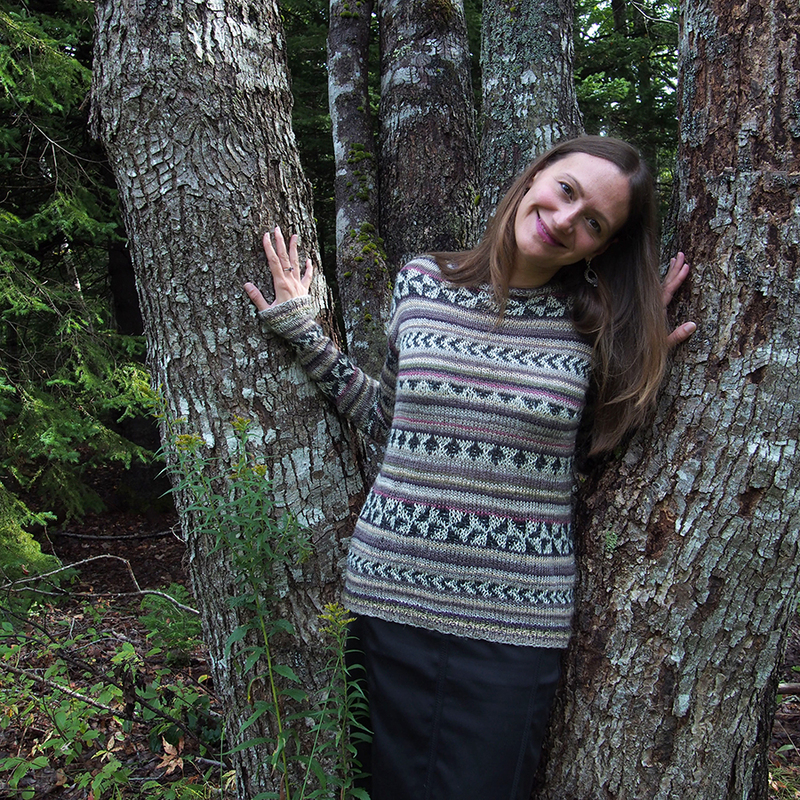 It's all the same motifs in different yarns. 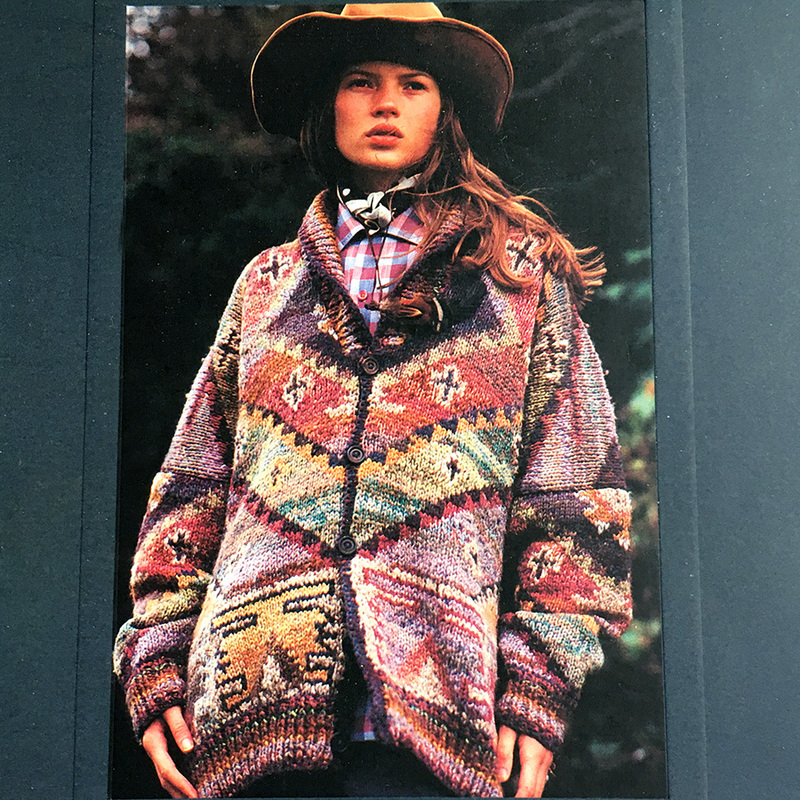 Even that Sofia Wrap with the cross motifs was originally a vest published in 1985 in Glorious Knits. 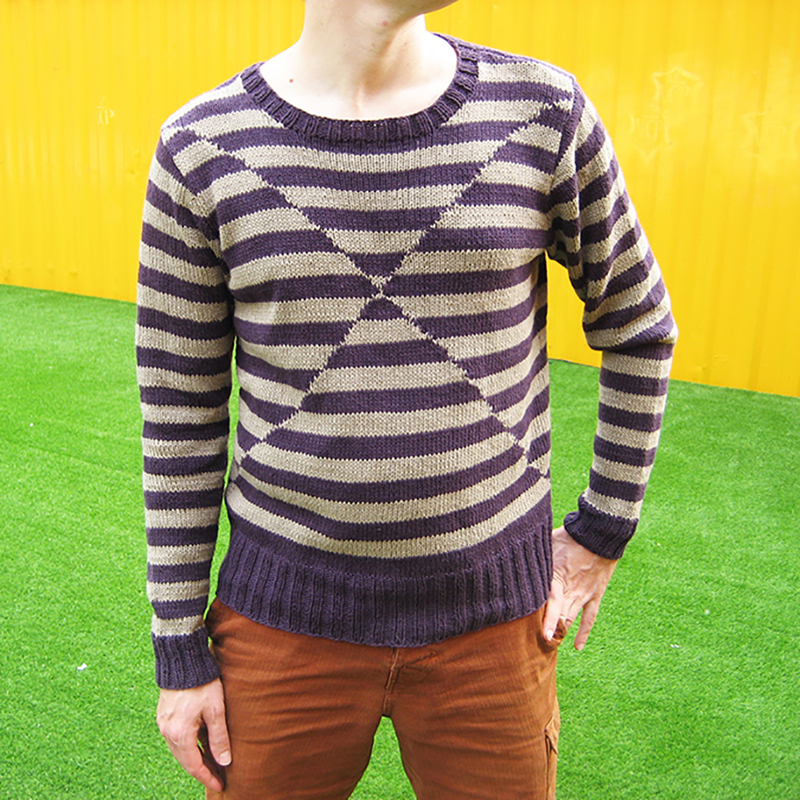 That's why I fell in love with Arezzo from Rowan Mag 57 -- I didn't recognize the pattern from any of his previous work. Not to mention (and here I am gobsmacked) that the colors and fit were completely modern!! Yes, fine, they're drop sleeves, BUT THEY'RE SKINNY! 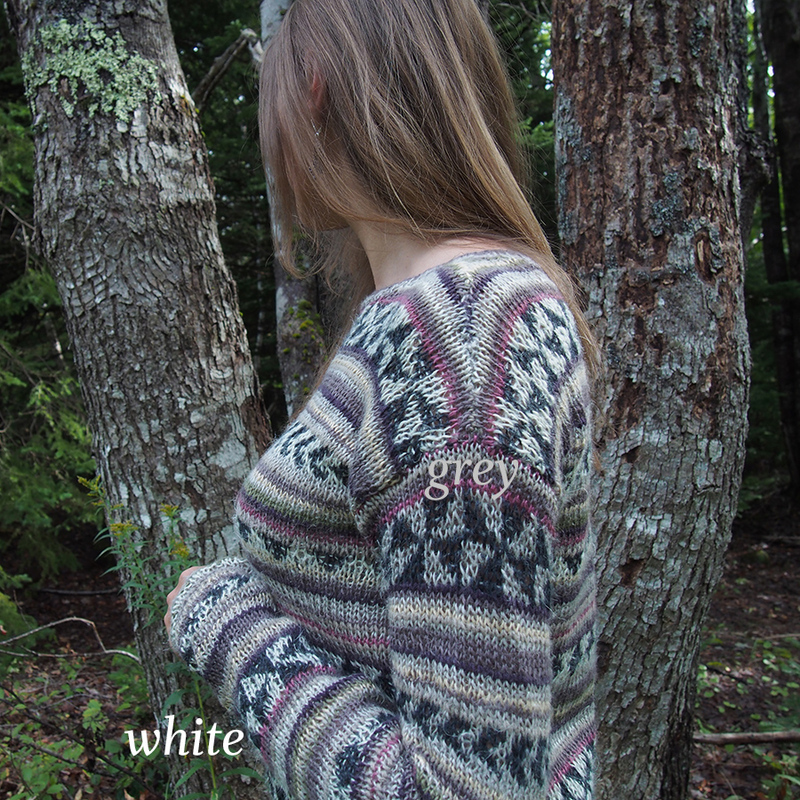 There are two yarns used in this, Rowan Pure Linen (a fave) and Creative Linen. 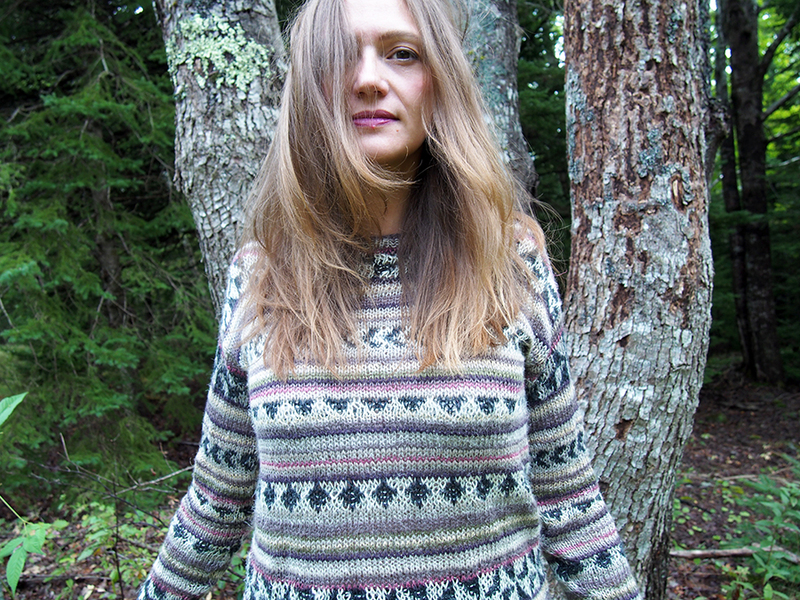 I didn't change any of the Pure Linen shades, but I used leftovers from a sweater I made for my husband for the Creative Linen. The pink color morphed into a deep eggplant and muted the piece nicely, I think. 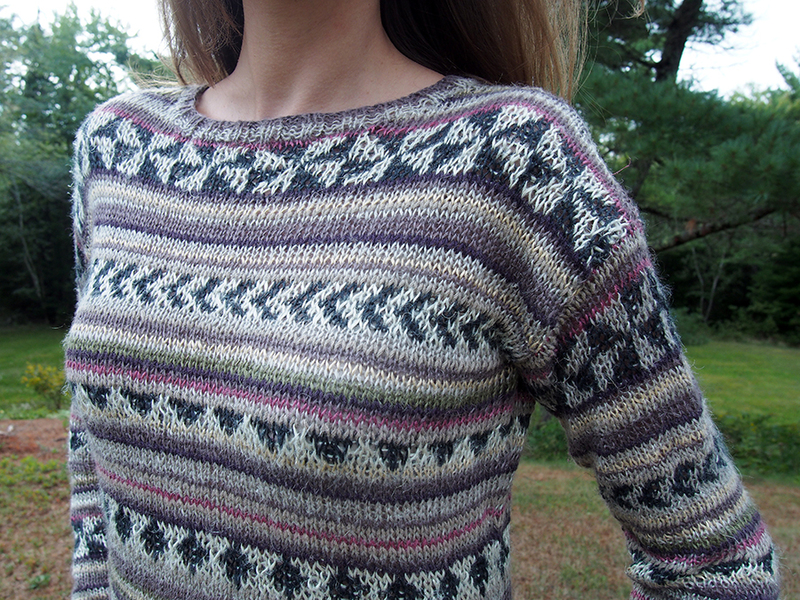 Oh -- and about that intarsia. 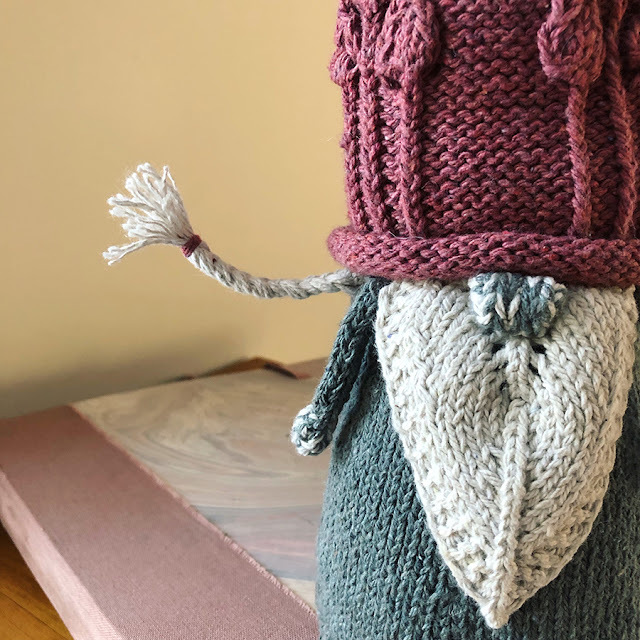 It is absolutely essential that you either 1) knit those intarsia sections purposefully loosely, or 2) use a needle 2 sizes larger for those parts. If not, you WILL see changes in tension and unsightly puckering. As usual, I had a bit of a disaster I had to fix! Halfway through the front I realized I hadn't finished a repeat of a motif, UGH. 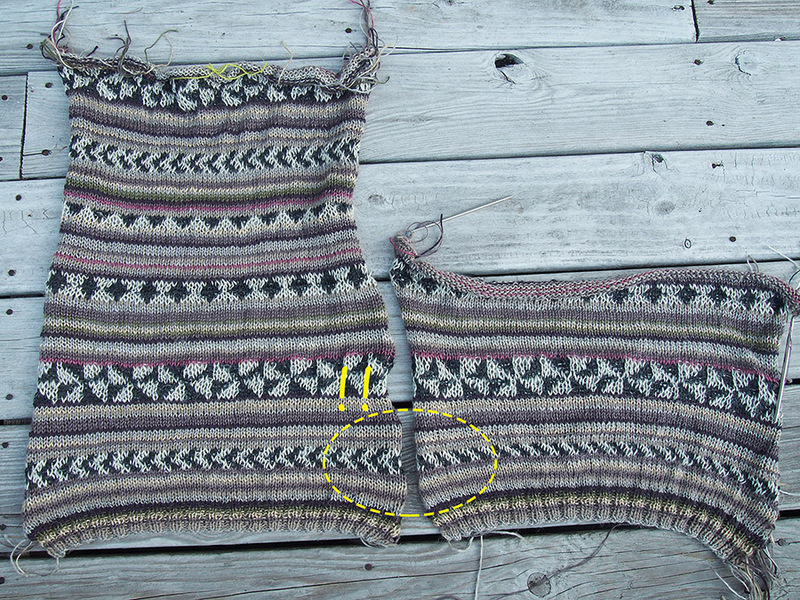 To fix something like this without frogging, take one knitting needle and slide it through the last row that was correct (in this case, the end of the black and white section). Then slide the stitches from TWO rows above onto another knitting needle and put it aside. SNIP the center of the row above the first needle and unravel the row to separate the knitting into 2 pieces. Pick up the first needle and use it to knit the rest of the rows you missed MINUS one row (the row that was below the other needle holding stitches). 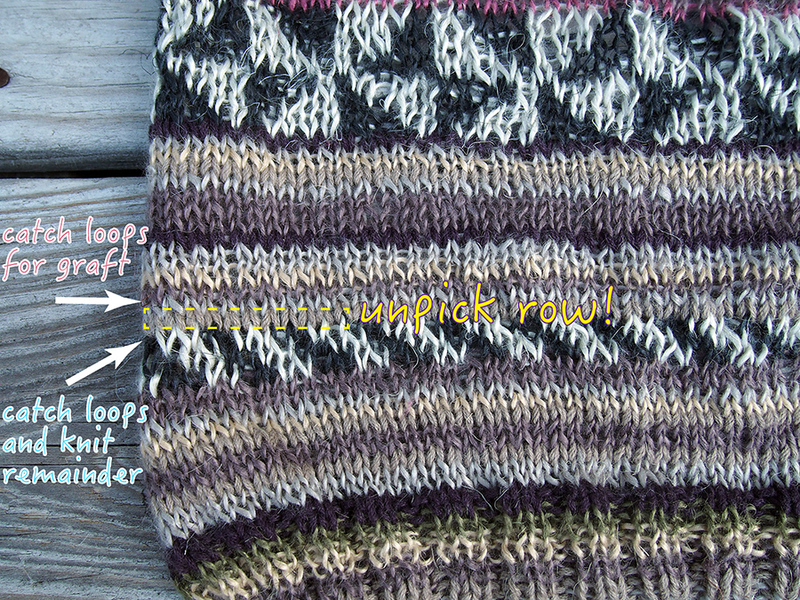 To finish, use kitchener stitch to link the two sections together with the color of that remaining row. 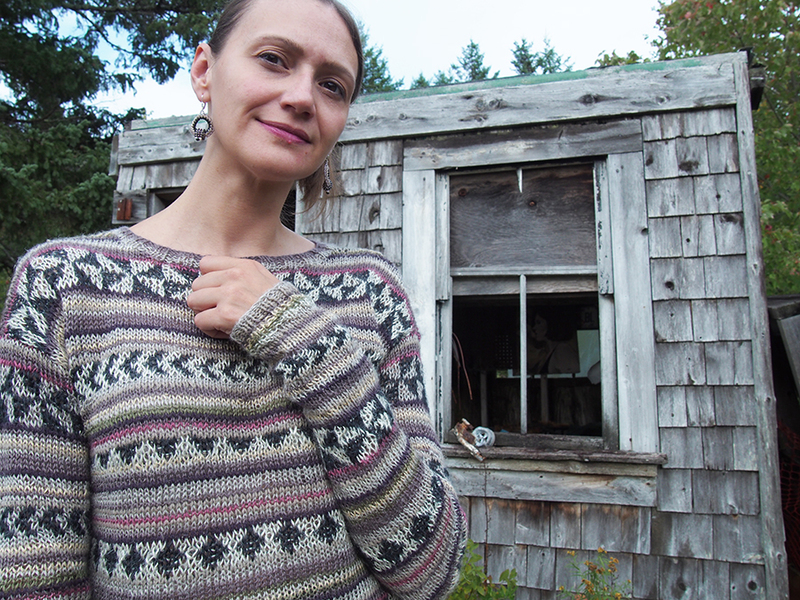 TIP FOR THOSE WHO HATE WEAVING IN ENDS: In this garment, there is often only one row of a color before it changes. 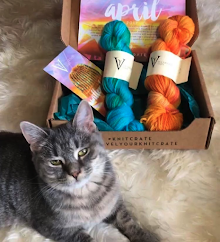 If a row of the same color is coming soon and you want to carry the yarn, you might be out of luck because your yarn is stuck on the wrong side. DON'T CUT IT! 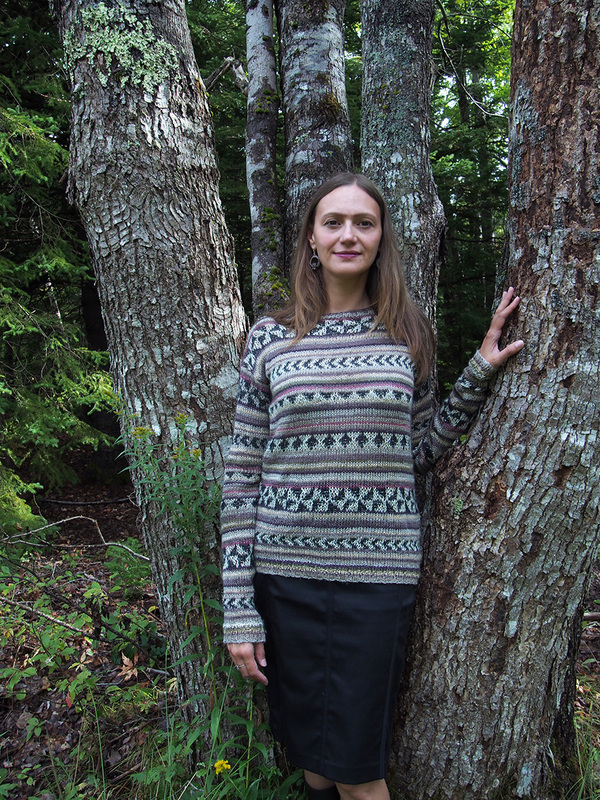 Did you know, you can start a row from any side of the knit with the identical result? Yup. 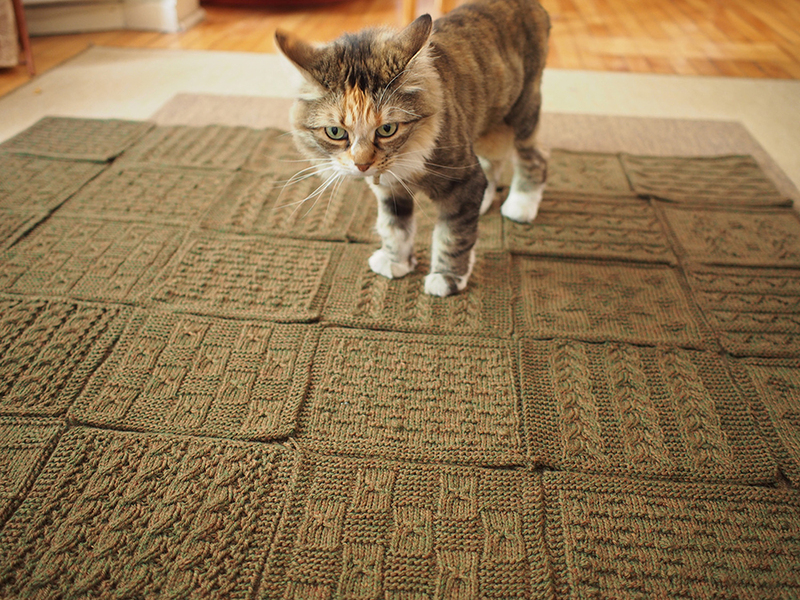 Just start the rows wherever you need to, purl side or knit. I mentioned I'm completely addicted to beadweaving right now. 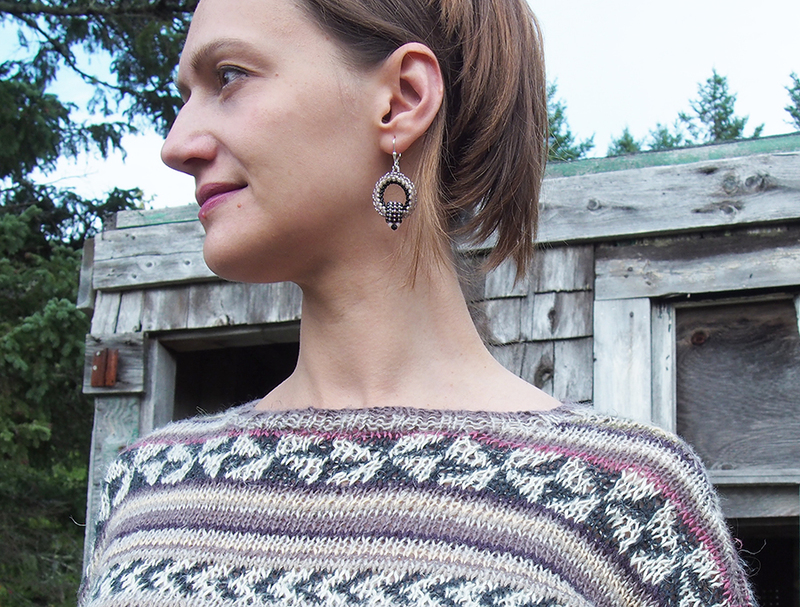 I made these earrings recently and they match the sweater perfectly! 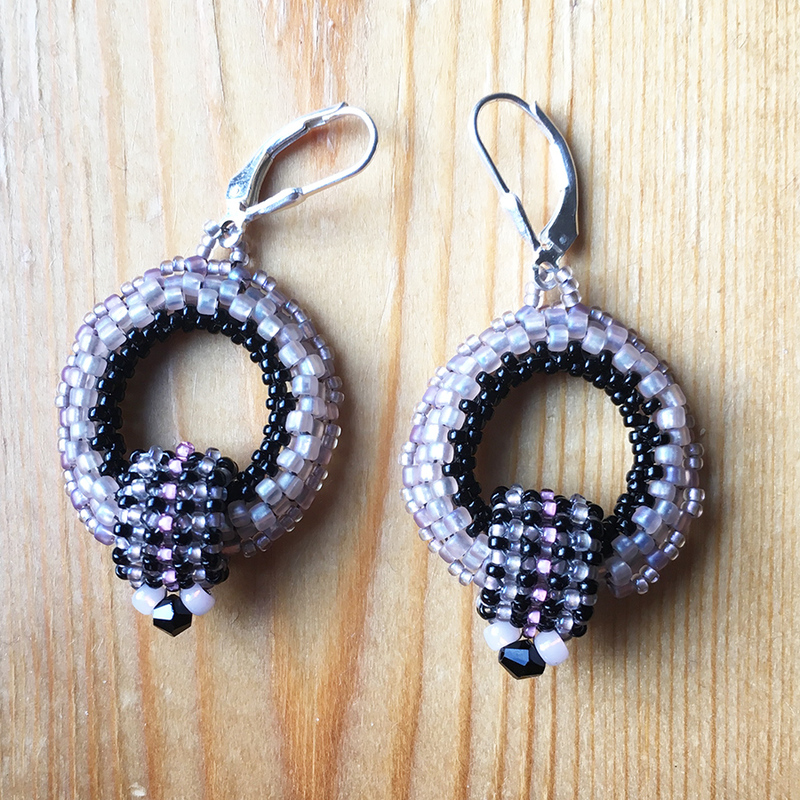 They were done with size 8, 11 and 15 seed beads and a couple of bicone crystals. 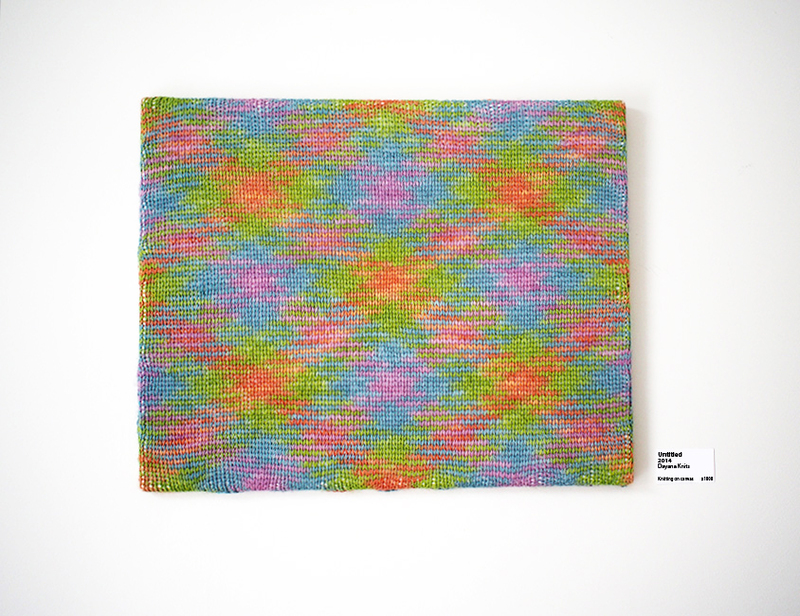 The pattern is from Marcia DeCoster's book Beads in Motion. 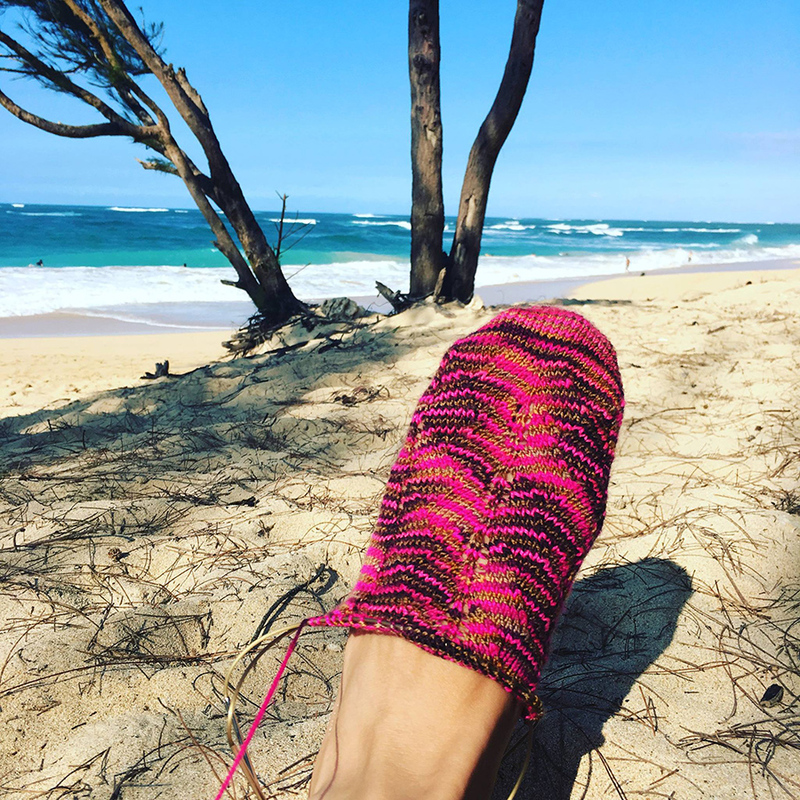 I have a Pinterest board where I am adding my beadweaving pieces and their patterns, if you'd like to follow. Love it, Dayana! 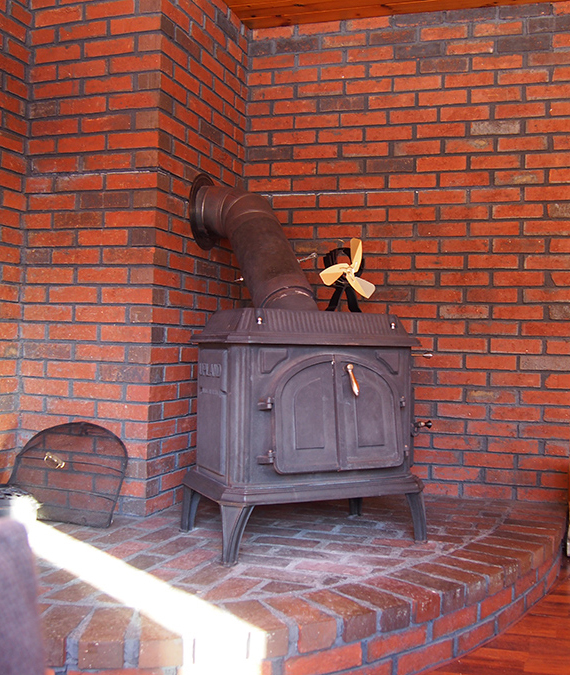 I also love the "Rowanesque" photo shoot surroundings. I'm a Kaffe fan too, but I wish I had the tall, slender body you have! Diana, I admire you a lot! 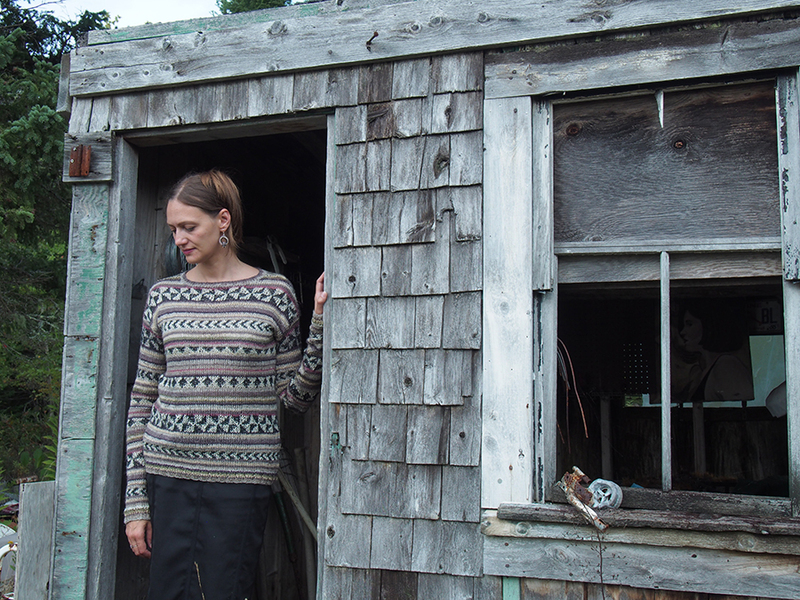 Great sweater, fab earrings! Terrific photos! I've been missing your blogs. Now I can see why you have been so busy. That was a very clever fix to the front of your jumper. It would have been galling to have to rip out all that work.